Jack: "Last night I was recording some sounds and I recorded your accident. I got the whole thing on tape." Sally: "Oh. You recorded the accident." Jack: "Yes I did. Except I don't think you had an accident. I think your tire was shot out." Brian De Palma has directed a number of great films, especially during the period from 1973 throught 1987 when he helmed some truly landmark projects. With a unique library of films like Sisters, Phantom Of The Paradise, Carrie, Dressed To Kill, Scarface, Body Double, The Fury and The Untouchables, De Palma made his mark as director with a strong, highly visual style, reminiscent of such masters as Alfred Hitchcock. 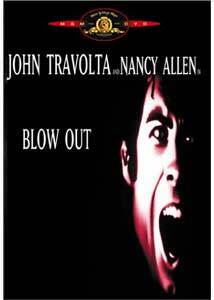 In 1981, De Palma and MGM released the intriguing thriller Blow Out, one of his first forays into the use of a conspiracy theory as the focal point of the storyline. Jack (John Travolta) is a movie sound effects man, who works on low-budget slasher films in Philadephia. During one of his lonely, late night walks to record various sounds for possible film use, he witnesses and records an accident that sends a car hurling into a dark river from an apparent tire blow out. Jack rescues a young woman from the car, but the driver unfortunately is dead. After taking the woman, Sally (Nancy Allen), to the hospital, Jack discovers that the driver of the car was presidential candidate Governor George McRyan (John Hoffmeister). Before long, the political spin-doctors are advising Jack to tell the press that there was no woman in the car, in order to spare the late governor's family any additional grief. To complicate matters, Jack insists that he heard another sound before the tire blew out, and hints that it may have been a gunshot. As Jack and Sally attempt to find out the truth, the forces behind the cover-up work to eliminate all witnesses. Blow Out was written by De Palma, and seems to borrow some subtle thematic components from the infamous Ted Kennedy/Chappaquidick incident, as well as other potential or imagined cover-ups. Powerful political figures, driven to murder, litter the background of Blow Out and seem to wield some of the same cutthroat power that many real-life conspiracy theorists have attached to other political giants. The conspiracy theory that lurks beneath the surface of Blow Out seems all too potentially real, and De Palma layers suspense and tension skillfully. His script suffers from only a few sequences that require a bit more suspension of disbelief than I would have preferred, yet as with many of De Palma's more visually powerful films, I allow him the necessary wiggle room. Much of the striking appearance of Blow Out is due to the incredible work of legendary cinematographer Vilmos Zsigmond (The Deer Hunter, Heaven's Gate), an occasional collaborator of De Palma's who is near the top of his game with this film. His work with De Palma has been some of his best, and Blow Out is laden with a rich landscape of powerfully sweeping shots, unusual camera angles, and strong colors that easily elevate the experience from a paint-by-numbers thriller into something that more often than not resembles true cinematic art. Like any substantial artist, Zsigmond's eye for the manipulation of contrast and color to set a specific tone comes across beautifully, and under De Palma's direction, propel Blow Out beyond the limits of the genre. De Palma and Zsigmond together are the real stars of Blow Out, with Travolta and Allen simply filling the canvas when needed. John Lithgow and Dennis Franz have small, but pivotal roles, and their presence is also significantly enhanced by the inherent skills of director and cinematographer. While the cast does a more than adequate job, with strong performances all around (even with Allen's annoying Betty Boop-esque voice), Blow Out is less about the individuals than it is about the overall experience. Many of De Palma's works include signature scenes that standout over others. Blow Out contains a scene at the midpoint, where Jack is desperately searching his studio for an audio tape containing the evidence. With pulse-quickening tension, De Palma chooses to continually pan the camera around the room in a dizzying 360-degree spin as Jack tears apart boxes and drawers. The scene is completely free of dialogue, with only a steadily layered series of various sounds (a ringing phone, the hiss of a tape player, for example) that builds quickly to a level of cacophony that equals Jack's fear, as we only see him sporadically as the camera pans past him. Near the film's conclusion, De Palma stages a train station sequence that is similar in tone to what he would do years later in The Untouchables. It is an intense scene, and De Palma once again proves how adept he is at directing captivating visual images while still keeping the suspenseful plot moving forward smoothly. A lot of naysayers have ripped his style over the years as manipulative and derivative, but there are few other modern thriller directors on the level of De Palma capable of creating such engaging films; David Fincher (Fight Club, Se7en) certainly comes to mind as another director with a comparable visual style. De Palma is still directing features, and I hope there is the opportunity for him to assemble another film as strong as Blow Out. Image Transfer Review: MGM provides both a 2.35:1 anamorphic widescreen and a 1.33:1 full-frame version (widescreen on one side of the disc, full-frame on the other). Obviously, the 2.35:1 transfer is the way to go, especially with an offering from such a visually driven director as De Palma. The color palette is used effectively, with strong, vibrant colors offering dramatic contrast against a dominant base of blacks and browns. The transfer itself is free of nicks and blemishes, and looks relatively clean. I found some of the night scenes to fall victim to somewhat shallow shadow depth, which detracted only slightly from the overall experience. Audio Transfer Review: It is refreshing to hear such a solid 2.0 mix on an 1981 release. Dialogue is clear, and the Pino Donaggio score sounds as full as the limitations of the mix allow, though not nearly as good as Bernard Herrmann's score on De Palma's Obsession, which had the benefit of a 5.1 remix. Despite bordering on sounding a bit tinny at times, MGM's audio transfer on Blow Out remains relatively consistent throughout. A Spanish 2.0 mix is also provided. Extras Review: Apparently MGM considers the definition of "extra" to mean a single theatrical trailer. In this case, it's a nicked and scratched 1.85:1 print of the theatrical trailer for Blow Out, which manages to reveal all of De Palma's twists in under two minutes. What a shame. A sharp, full motion menu looks great, but offers little in the way of user benefits. Blow Out remains one of De Palma's better films, and the twenty odd years since it's release have done little to dampen it's impact. It is a real thriller directed by one of the genre's finest. Unfortunately, we have yet another De Palma commentary-free DVD, and that just isn't right. I imagine in the near future there will be a supplemental heavy De Palma boxed set, but until then don't bypass on Blow Out.